Sun, sea and... just enough breeze. Perfect! It's a few years since I competed in a winter league event, but now there's a new Southern league closer to home, competing in winter has become a tempting proposition once again. The first event certainly didn't feel like winter - the sun shone all day. 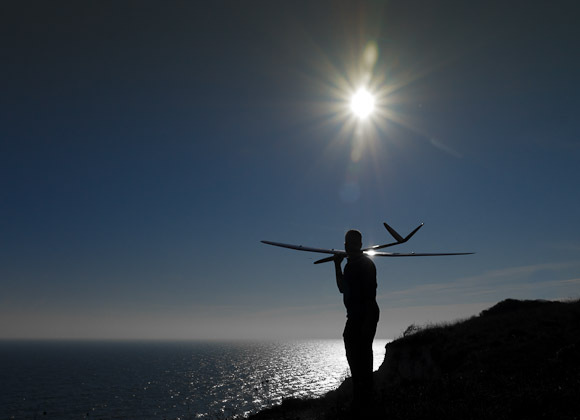 The competition took place over a cliff situated just beyond the western edge of Eastbourne. It was the first time most of us had flown there, which made it a lot of fun. Race times were nothing to write home about, due to the wind being light and slightly cocked off the slope - but hey, it was the same for everyone. Six rounds were flown before CD John Phillips called time. The winner by a convincing margin was Simon Thornton, despite damaging his number one model after it was launched into some vicious rotor. Local pilot John Phillips was second, and John Bennett third. Simon achieved FTD with a 60.61 second run. Ian Mason had the dubious honour of retiring early to a failed battery pack. Fortunately he was alerted by telemetry before any damage was done. I managed to break the tail joiner on the Skorpion on landing, due to some nasty rotor. I can't remember a model sliding backwards for such a long distance! My thanks to John Phillips and the ESSA and helpers. JP gave me some advice on some photo opportunities in Eastbourne - great advice as it turned out, see below!